Are you a GroupWise Power Administrator? 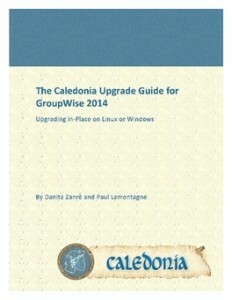 Then you need to join the Caledonia GroupWise Power Administrator Resource site! We strive to be the definitive resource for GroupWise, and have a number of unique benefits to offer you as a member. Click the More Info button below. Print version available exclusively at lulu.com. Click to purchase (you will leave this site, and create a separate order at Lulu.com). Caledonia Network Consulting is an energetic communications company, dedicated to providing quality GroupWise support and training. We provide a full range of GroupWise expertise for your needs. Whether it be migrating an existing GroupWise system to the latest version, or designing and installing a new GroupWise system, training your administrators, trainers and end-users, or simply providing as needed support for your in-house maintained system, our engineers are the best choice to assist you.